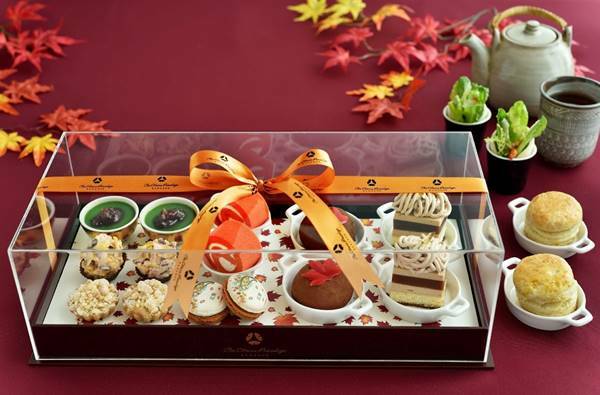 Celebrate Japan's Autumn colours with Okura Koyo Afternoon Tea. The Okura Prestige Bangkok is serving a special Koyo Afternoon Tea to celebrate Japan's spectacular Autumn colours. Koyo describes this process of leaves changing colour as the colder weather makes it's mark. Leaves begin to change colour firstly in Hokkaido, usually in mid September, before moving down to the Japanese archipelago over the course of about 50 to 60 days. The Okura Koyo Afternoon Tea includes seasonal delicacies presented tastefully in a box. Items include matcha green tea cremeaux, Koyo orange jam roll and Koyo macaroons. Koyo macaroon boxes of four, six, and eight start at 230 baht.